All 62 people onboard the plane, including eight Ukrainians, are dead. 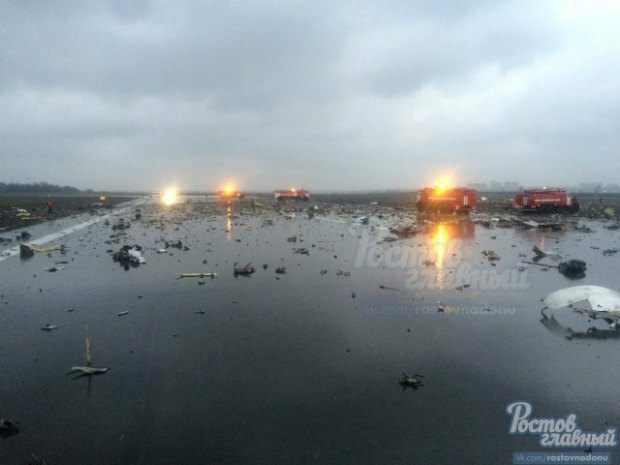 The FlyDubai Boeing 737-800, flying from Dubai, crashed while attempting to land in Russia's Rostov-on-Don. According to the company, there were 55 passengers, including 44 Russians, eight Ukrainians (seven adults and one child), two Indians and an Uzbek national. The crew included two Spaniards, one Russian, one Kyrgyz, one Cypriot, one Colombian and one citizen of Seychelles. The reasons behind the crash are being investigated. According to the Russian news agency TASS, the plane failed to land at the first attempt and crashed at the second one. The plane exploded after it hit the ground. The company said it was "shocked' and expressed its condolences to the bereaved families. This is the first crash in FlyDubai's history.